The biggest story in New York's Gubernatorial election is not about what has happened, but what hasn't happened. Louisiana Governor Bobby Jindal came to NYC on Thursday to back Astorino as well as hosting a fundraiser. But all Jindal's visit did for political insiders is highlighted the freeze-out of Astorino's campaign from mainstream Republican circles, including the Republican Governors Association, headed by NJ Governor Chris Chiristie. But back to Jindal's stump stop for Astorino, Jindal brought the fire. During the news conference on Thursday, Jindal endorsed fellow Republican Astorino while attacking President Obama and Governor Cuomo on Ebola and Common Core, calling the President's inactivity on Ebola "malpractice" and Governor Cuomo's failure to be proactive. "Time and time again, the CDC and the administration have told us things that turned out not to be true. . . .They have been a dollar short and a day late time and time again; they are again counting on hope. Hope is not a strategy," Jindal said. “We need to play offense instead of defense” Jindal stated as hundreds of rush-hour commuters passed the gathering in Grand Central. 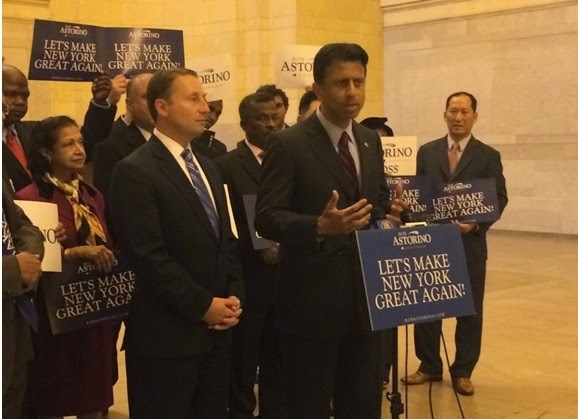 Jindal is not the only Republican Governor aiding Astorino’s long-shot bid. Texas Governor Rick Perry was in New York recently, throwing his support for his fellow Republcian and hosted a fundraiser. even former Republican governors Jeb Bush and Mitt Romney put their names to fundraising emails, referring to Cuomo as a “typical corrupt politician by lying about his Start-up campaign of economic-development. Despite those efforts, Astorino's campaign has had a hard tight gaining traction, even in Republican circles, mainly because of Governor Chris Christie's refusal early in the campaign to throw support across the Hudson to the Republican candidate next door, calling Astorino's effort is a lose cause. With polls showing Astorino behind by as much as 17 points, I wonder if Christie was right, or if his inaction doomed Astorino before he could really take off. For his part, Gov. Jindal remained diplomatic. “Chris is perfectly capable of speaking for himself”, he said. The heavy poll numbers didn't stop NY State Democrats from using Jindal's appearance to score some political points. With both Jindal and Cuomo mulling a presidential run, Dems pot-shotted Astorino as being too far right leaning to be taken seriously in New York. 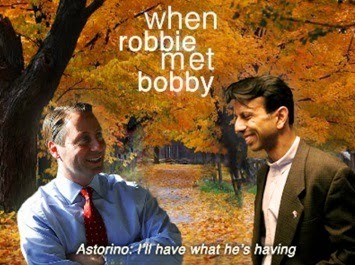 Releasing a headline called “When Robbie Met Bobby” Dem sought to portray the two as ultraconservative with views "dangerously" out of step in New York - home of municipal IDs for illegal immigrants and the most restrictive gun laws this side of fascism. You gotta love liberal hysteria propaganda - moking conservative values being “Ultra Conservative”while forgetting that the bigger issues of the economy, debt, schools and failure to prepare for Ebola. Priorities.